Today i am going to tell you about Subnetting and how to do it. A subnetwork, or subnet, is a logically visible subdivision of an Internet Protocol (IP) network. All computers that belong to a subnet are addressed with a common, identical, most-significant bit-group in their IP address. A means of making a splitting a single IP address into multiple network addresses. It is accomplished by mathematically combining an IP address with another set of numbers called a Network Mask. The process of subdividing a Class A, B, or C network and into smaller portions called Subnets. Basic subnetting is very easy when performed in seven steps. This example uses the Class C address 211.212.10.0. Using the seven steps provided here, you can create a subnetting scheme that allows you to use this address on your network. Determining the number of subnets you need is the very first step in subnetting. The number really depends upon your particular network. 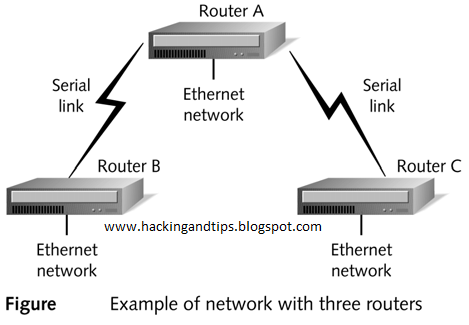 In Figure the network consists of three routers connected via serial links. Each router also has a single Ethernet network attached. Each shared serial link requires one subnet. 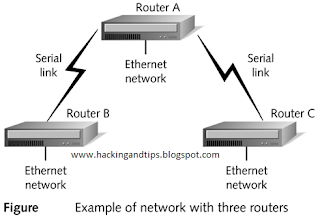 Therefore, you need two subnets for the serial links between Router A and Routers B and C. You must also have one subnet per Ethernet interface on each router. Since you have three Ethernet networks, you need three subnets. Using this very simple counting method, you find that you need a total of five subnets. Unfortunately, you have been assigned a Class C address. The network address 211.212.10.0 allows for a single network of 254 hosts. You must borrow host ID bits to make this address work for you. After you determine the number of subnets you need and the number of bits you can borrow, you must calculate the number of host ID bits you must borrow to get the needed number of subnets. The formula for determining the number if bits you must borrow is 2n-2= # of subnets. The n represents the number of bits you borrow. In other words, raise two to the power of the number of bits you borrow and subtract two from that number. The result is the number of useable subnets created when you borrow that number of bits. For the example network, you need five subnets. If you borrow three bits, the formula’s result is six usable subnets: 23 = 8-2 = 6. Step 5 calculates the new subnet mask after you borrow the host ID bits in Step 4. You must add the decimal value from Step 4 to the default subnet mask for the class of address you are subnetting. The example is a Class C address, so the default mask is 255.255.255.0. The new mask after borrowing three bits becomes 255.255.255.224. In Step 6, you must find the lowest of the high-order bits (bits starting from the left) turned “on.” Step 6 takes you all the way back to earlier in the chapter to the values found in each bit position within the octet. Our example defines the octets from which we borrow as 11100000. The highest order bit turned on represents 25, which equals 32. Since 25 is the last high-order bit turned on, the Host/Subnet variable you use in Step 7 is 32. IP addresses cannot be all ones or all zeros; therefore, in most cases the first range of addresses and the last range of addresses are unusable. (In some special circumstances, you can use the first range of addresses, or subnet 0. Only certain manufacturers’ equipment, such as Cisco Systems, fully supports the use of subnet zero.) In each subnet, the first IP address is unusable because it represents the subnet ID. The final address is also unusable because it is the broadcast address for the subnet. Due to these two restrictions, in subnet one, 211.212.10.33 is the first useable host ID and 211.212.10.62 is the last useable host ID. This example takes a Class B address and tries to fit it within the needs of a network containing 1000 subnets. You are assigned the Class B address 131.107.0.0. Using the following seven steps, you are going to subnet the Class B address to meet your needs. Examine your network and determine your needs based on current network configuration and future growth (in this case, 1000 subnets). The decimal values for the octets are 255.192. In the next-to-last step, you must find the value of the lowest high-order bit turned on in each octet, from which you borrowed host bits. Since this example is a Class B network and you must borrow a great number of bits to get the proper number of subnets, the borrowing crosses an octet boundary. As a result, you have two Host/Subnet variables. In this example, the variable in the third octet is 1, and the variable for the fourth octet is 64. You get these values by looking at the binary numbers in Step 4. The third octet has the final bit position, or the 20 bit position, turned on. Since 20 = 1, your variable is 1 in the third octet. In the fourth octet, the second high-order bit or 26 is turned on. The variable in this octet is 64. In exam like ccna and mcitp u cant use this so we have to calculate by own ..
grate work man. lov this post.